2015 – Progetto in collaborazione con ing. V.Bonetti per l’ampliamento di complesso scolastico in una regione della Mongolia particolarmente povera e con temperature particolarmente rigide. 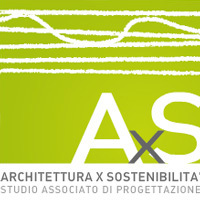 Il progetto ha posto particolare attenzione a temi quali Risorse Locali, sostenibilità ambientale, sensibilità al clima,economicità, trasferimento tecnologico e replicabilità. Colors in Mongolian culture: White signifies the beginning of something new. Red is considered the colour of joy and symbolises happiness, victory and hospitality. Yellow is one of the most respected colours, it means gold. Blue is the colour of the sky and signifies eternity and loyalty. Raw earth is the world’s most used building material. Spontaneous architecture rooted in tradition and transfer of knowledge. Avaliable and easy workable, soil is economic and has an important thermal peculiarity: it allows to maintain optimal interior temperature and moisture level. Despite high urbanization, more than half of the Mongols continues to live in the traditionalGer, whether nomadic or inhabitants of towns and villages. The Ger has only one door and an opening at the top of the roof to release fire smoke and illuminate interior. Living in zenital light -the best kind of lighting- is an habit and a privilege. The building is shaped taking into account the extreme weather conditions and local culture. 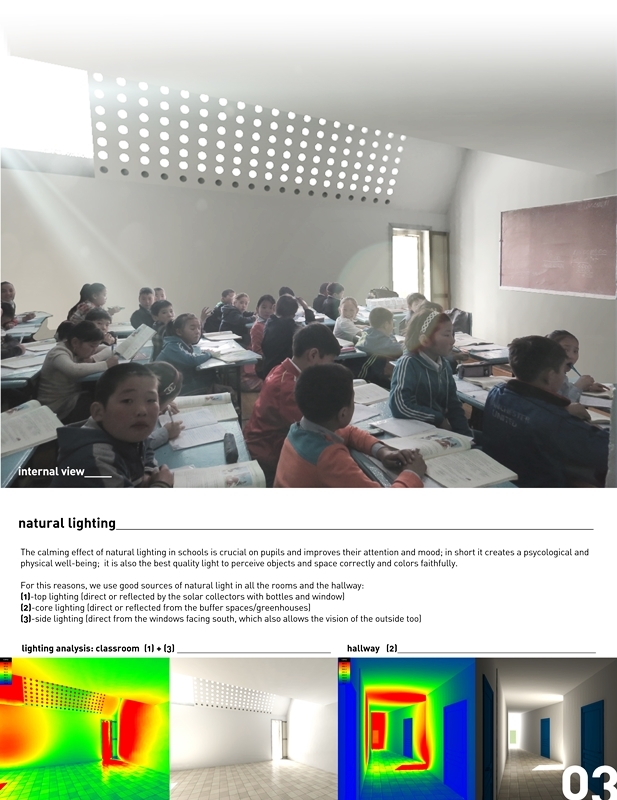 The need of minimizing heat losses from walls, roof and windows has led to a completely insulated building, where all the rooms are facing south and enjoying the sun path, while the parts needing lower operating temperture are located on the north side. 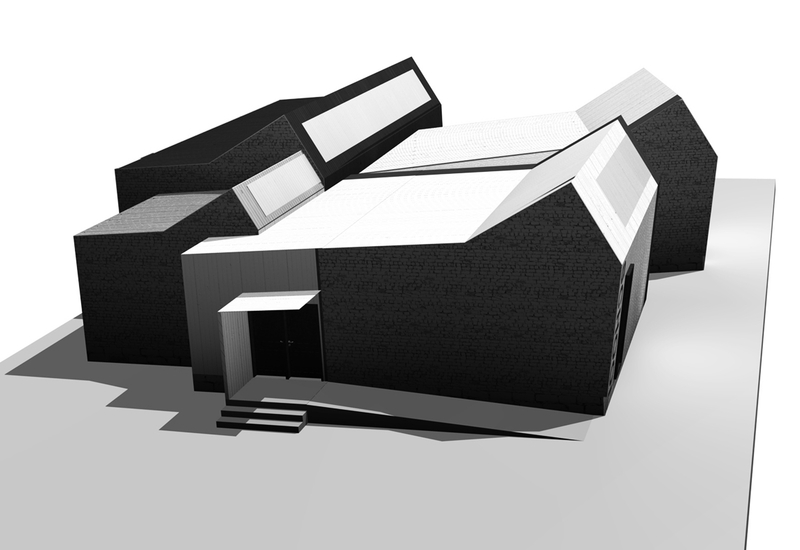 The envelope design maximizes solar gains (light and energy) and minimizes the impact of north winds. 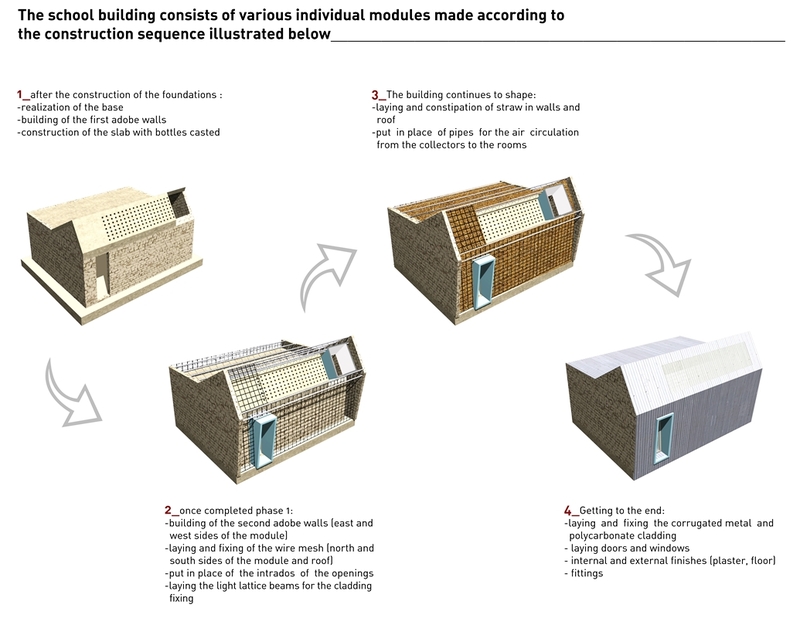 The building is created by the combination of various modules, interspersed with buffer spaces in which the greenhouse effect warms the inside air. This feature makes the design multisectional and repeatable. 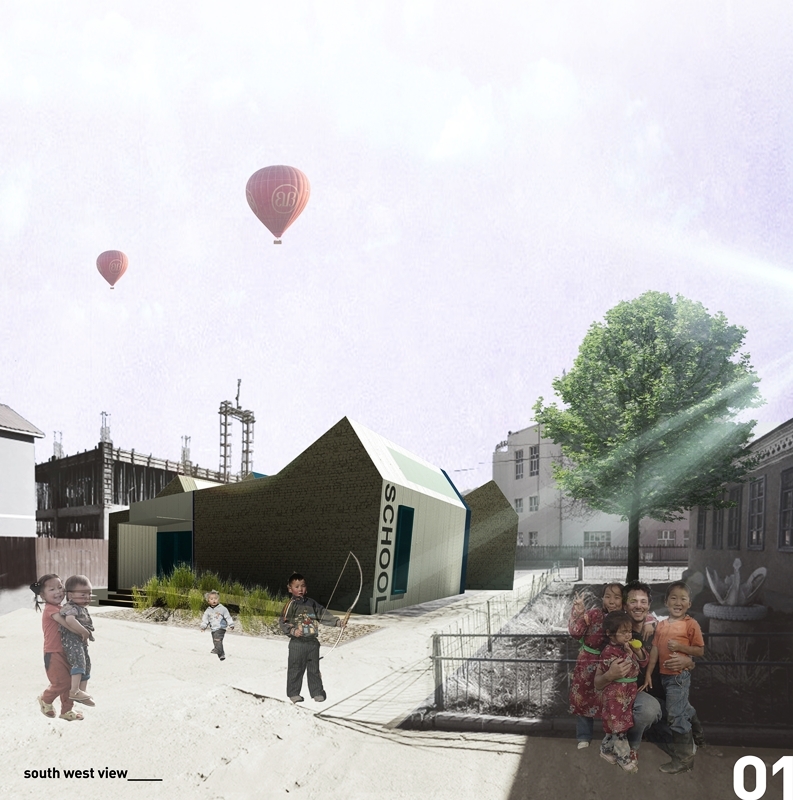 Due to the requirement of being inexpensive, the proposal considers mainly natural or recycled local materials -easily available, cheap and sustainable- and can be constructed simply using local skills. 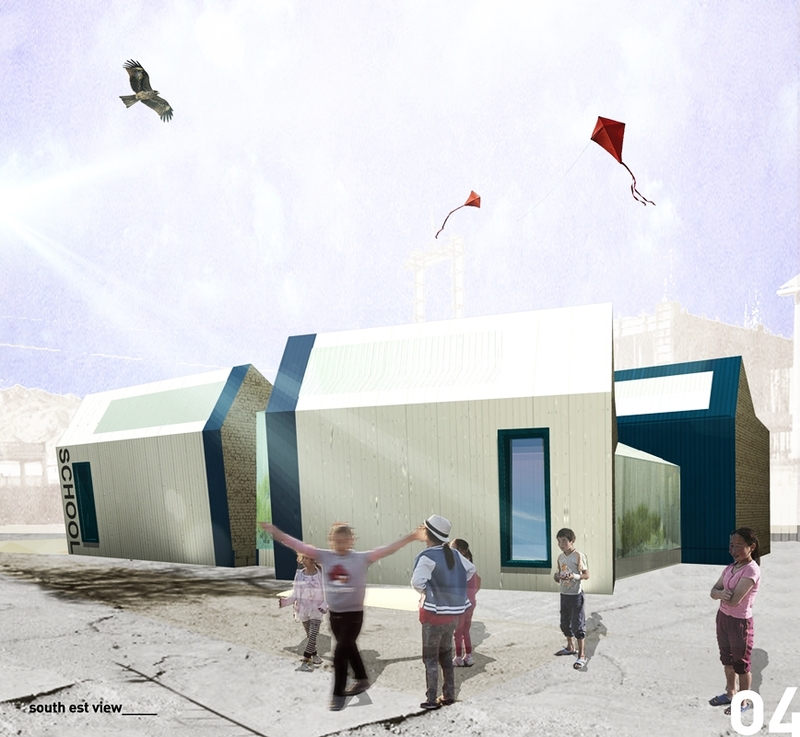 Therefore, this structure represents a pilot design, and could become a permanent solar lab, in which children and adults learn about low-cost high-efficiency buildings; whether successful, it may be useful to repeat the same experience elsewhere. 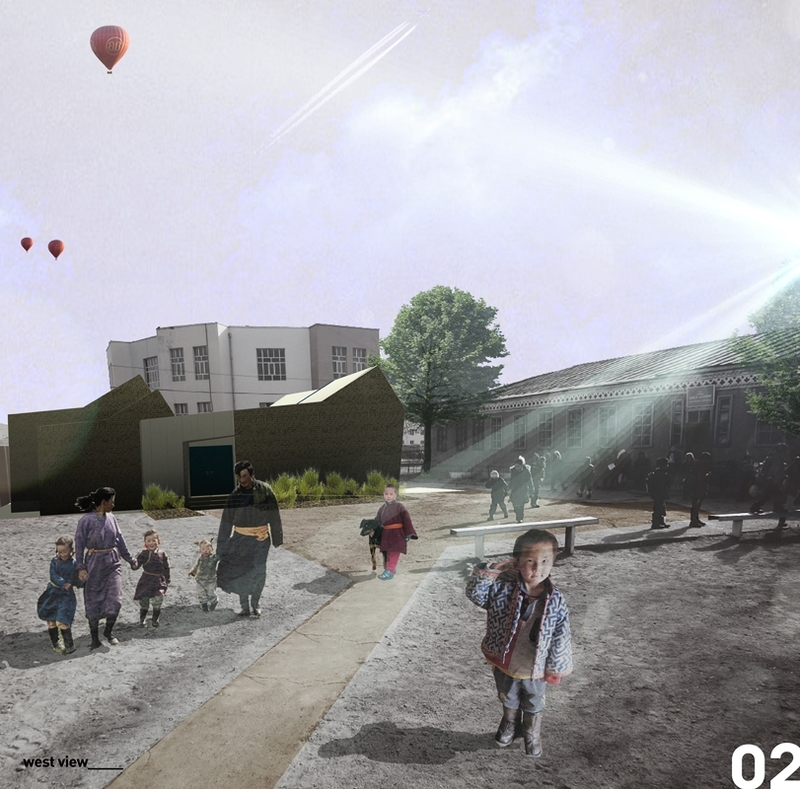 Site B has been chosen because best suitable for solar design: here the new solar school addition has maximum exposure to sunpath and sun radiation.